My youngest son’s indoor soccer team for this winter chose the team name “Red Dragons,” and I was absolutely thrilled! You see, I’d been eyeballing this cookie cutter for quite some time, but I didn’t have a good enough reason to order it. When the team of red-shirted kids decided on “Dragons,” I knew it was fate! 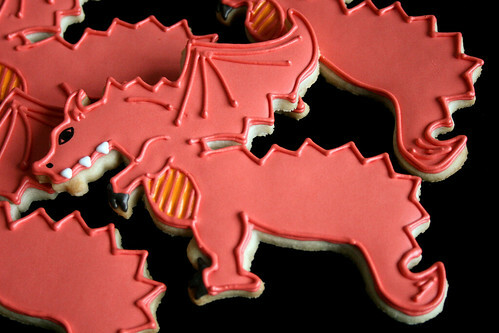 Once I got the cutter, however, I couldn’t decide how to actually make the dragon look inside. Even as I was baking the cookies, I still hadn’t decided on a decorating design. 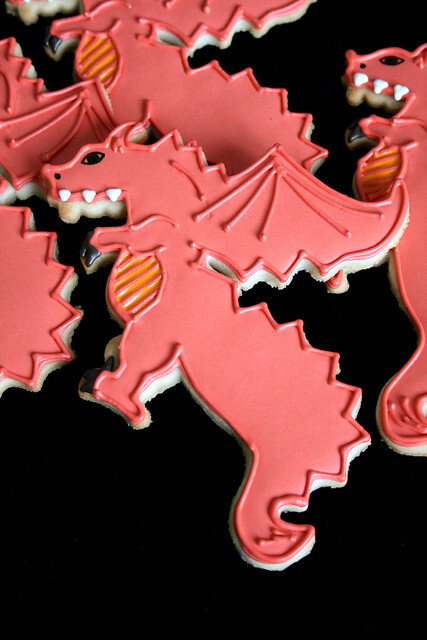 While the cookies were cooling, I finally sat down, traced the cutter onto a sheet of paper, and then I set to work, drawing/making a dragon of the interior. Once I was happy with my sketch, I set to making my icings. 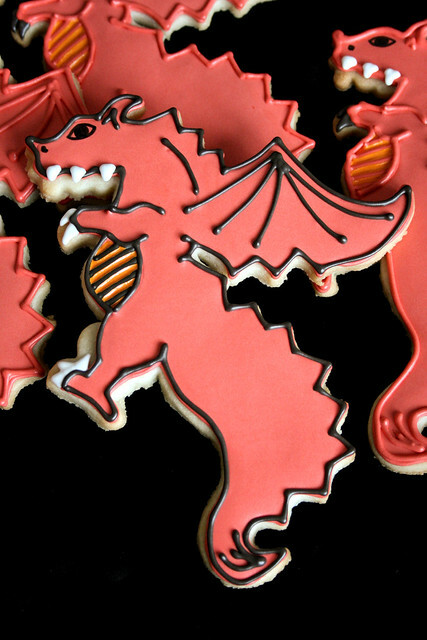 A fun, detailed red dragon! I piped his outline in red again as a finishing touch, and I was pleased as punch! I made many more, and with each one that I iced, I became more excited to see my son’s face when he saw the cookies! Tragedy intervened, I’m afraid. 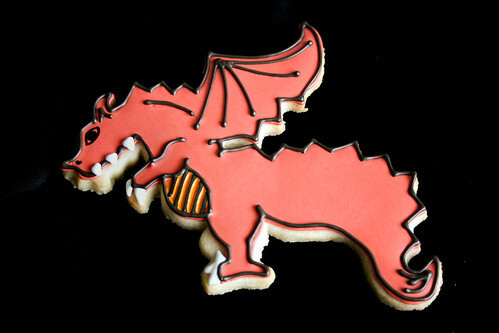 After making 14 big dragon cookies, I ran out of red icing for the final outline! I didn’t want to make a small batch of royal icing just for the remaining 7 dragons, so instead I nabbed the last bits of dark chocolate brown piping (from another project) and used it as the outline. And I ended up loving it EVEN MORE! Isn’t it funny how that works?! Among others that I asked, the dark outline is the clear winner, so I know that I will plan things on that side whenever I make these dragons again. Also, I took one last shot of just a single dragon by himself so that I can clearly remember the details for making him again in the future. My youngest LOVED the cookies, and so did all the kids/parents at the end-of-season pizza party! We had extras, and I passed them out to other children at the playcenter, too. In fact, it wasn’t until we were loading up in the car with the empty trays that my sons piped up, “Where are OUR cookies, Mom?” Oops! They’d been too busy playing, and I’d assumed they already had their cookies, so I’d given out all the rest! Your cookies are always amazing, but I think the darker outlined one stands out more. I bet everyone was thrilled with these cookies!! What sports season is next?!? Next up is A.J.’s track season (starts tomorrow), and then Jack’s spring soccer season kicks up again at the end of April. Then, thankfully, school is out for a few months and no sports besides swimming for fun! I definitely like the dark outline the best. It makes the details stand out more and adds a little dimension. So cute! In a fierce dragonly way of course. Of course. Thanks for your thoughts! 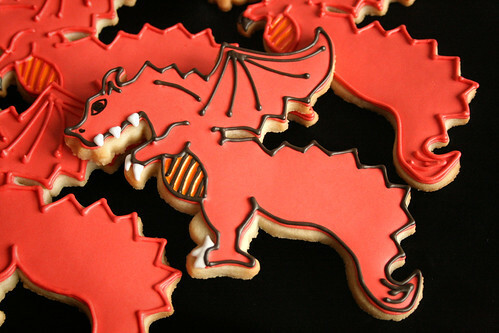 I love these dragon cookies! I always find that the black border brings out the cookie with a greater depth to it. Thanks, Paula! Isn’t it funny how the ones you don’t plan to a ‘T’ are the ones that can take your breath away sometimes? !